Founded at Bristol, Somerset, in February 1910 as British & Colonial Aeroplane Company Ltd, a factory was set up in two sheds in the village of Filton in south Gloucestershire, just north of Bristol. Sir George White was a wealthy Bristol businessman and his company was registered on 19 February 1910 with a capital of £25,000. First began construction of a number of biplanes under license from Societe Zodiac, but these were not completed because the sample aircraft bought from France could not be induced to take to the air. First aircraft produced were Bristol biplanes, usually known as the Boxkite, which initially were little more than copies of the Henry Farman biplane. Flying schools established at Larkhill, on Salisbury Plain, and at Brooklands, Surrey, 1911. February 1911 Deutsche Bristol-Werke established at Halberstadt, Germany, to operate a flying school and build Bristol airplanes; arrangement canceled June 23,1914. First military aircraft were monoplanes designed by Henri Coanda; No. 105 shared third place with a Deperdussin in the Military Aeroplane Competition of 1912. Bristol Scout, or "Baby Biplane", evolved by Frank Barnwell 1914. The two-seat Bristol Fighter entered service in 1917 and became regarded as the best general-purpose combat aircraft of the First World War. During the final year of the war the company produced 2,000 aeroplanes from its own factories. By the Armistice the payroll had risen from 200 in August 1914 to 3,000 and the original tram sheds were now part of a factory with eight acres of floor space. Following the acquisition of the Cosmos Engineering Company in 1920, the Bristol Company was also a major builder of aero engines. 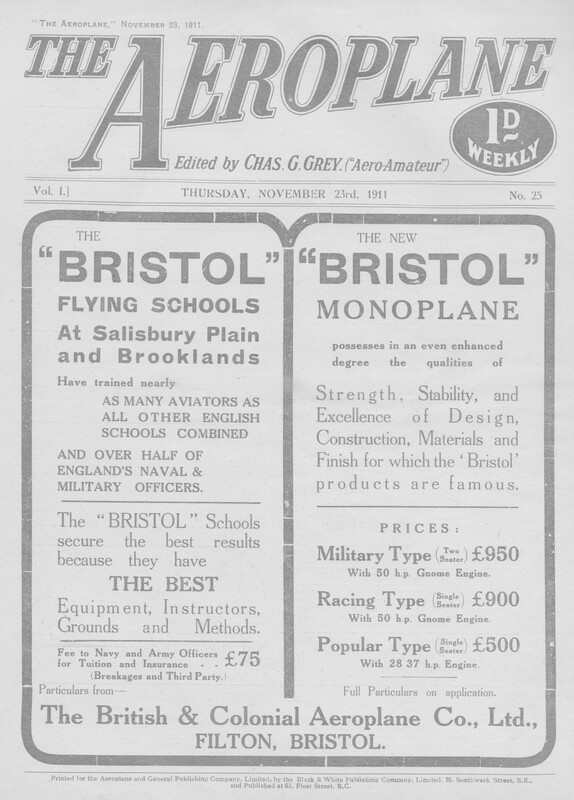 Renamed the Bristol Aeroplane Company on 9 February 1920. Problems of readjustment and survival were intensified by the general world-wide economic depression that succeeded the brief postwar boom. Diversification was one of the expedients adopted to keep the nucleus of the skilled workfiorce in being at Filton. Aircraft manufacture was augmented by produc-tion of bus and coach bodies and later of motor car bodies. Between the wars Bristol Bulldog biplanes had equipped nine RAF Squadrons by 1932 and were most widely used fighter until 1936. In 1935, Bristol's directors, realising that the company's capital resources were inadequate, resolved on 15 June to re-organise the firm as a public limited liability company with a share capital of £1.2million. Bristol Type 138A of 1936 captured world altitude record in September, 1936, then regained it from Italy in June 1937 with an altitude of 16,440m. Bristol Type 142, built as executive aircraft for Lord Rothermere, became the military Blenheim, an important light bomber in the early Second World War period. Beaufighter, first flown July 1939, became RAF's first nightfighter, subsequently an important antishipping aircraft armed with rockets, torpedoes, and bombs. Designed and built prototype of eight-engined 100- passenger Brabazon I, first flew September 4,1949; scrapped 1953 for financial/political/technical reasons. Type 170 Freighter first flown December 2,1945 and 213 built subsequently. Turboprop powered Britannia first flew August 16,1952, made the first non-stop airliner flight London, Vancouver (8,208km), June 29,1957, and first North Atlantic passenger service to be flown by a turbine-powered airliner on December 19 of the same year. A helicopter department was set up in 1945 as part of the aircraft division at Filton. Austrian born Raoul Hafner headed a research and development team which produced the Type 171 Sycamore. Subsequently entering service with RAF as its first British-designed helicopter in 1952. 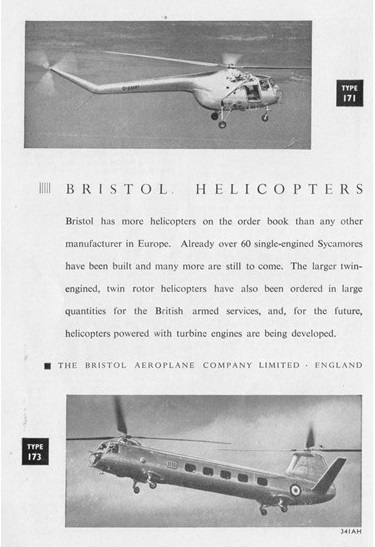 In January 1956 the Bristol Aeroplane Company had reorganised into three wholly owned companies; Bristol Aircraft Ltd, Bristol Aero-Engines Ltd, and Bristol Cars Ltd. Four years later Bristol Aircraft Ltd joined with Vickers Ltd and English Electric to become the British Aircraft Corporation. In 1960 Westland Aircraft took over the Bristol Helicopter Department. Research and development ot the tandem-rotor helicopters resulted in Type 192 Belvedere which entered service with the RAF, in 1961. On 28 December 1963 the separate companies merged their identities and Bristol Aircraft Ltd became the Filton Division of BAC. Four years later the Bristol title was lost from the engine side when Bristol Siddeley Engines Ltd became the Bristol Engine Division of Rolls-Royce Ltd. The nationalisation of the aircraft industry in 1977 resulted in the formation of British Aerospace (BAe) and the works at Filton became part of the Weybridge-Bristol Division of BAe Aircraft Group while the BAC Guided Weapons Division at Fillon became part of the Stevenage-Bristol Division of the BAe Dynamics Group.